Last week, GANADO Advocates assisted ELSA Malta with the organisation of the 2nd edition of the Maritime Moot Court Competition. Preparation for the event included an information session on Maritime & Admiralty Law that was delivered by Dr Matthew Xerri at the University of Malta, followed by a mentoring session by Matthew and Julienne Bencini for the participating groups. 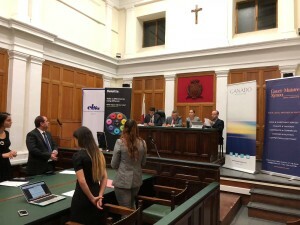 The firm’s Shipping team prepared an admiralty case related to a claim on bunker fees for the competition, which was held at the Courts of Malta. Four teams of two participants moved on to the semi-final, where two teams of plaintiffs and two teams of defendants had to compete against each other in front of judges. Dr Jotham Scerri-Diacono, partner within the Ship Registration team, and Dr Jan Rossi, associate within the same team, formed part of the panel of judges. In the final round, teams were given ten minutes to present their case, followed by two rounds of five minutes for rebuttal and concluding in the announcement of winners and presentation of prizes by the judges.